Hello! My name is Kybosh. Mom usually calls me Ky or Little Miss. 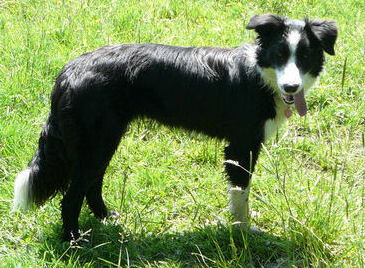 I am a border collie and I was born on July 20th, 2009 in Lethbridge, Alberta. Now I live in Crofton, BC with my mom Kelly, canines Maggie, Boom-boom, Reckless, and Little Monkey, and Quincy the cat. My mom was already hooked the game of flyball with my brother Reckless, so it was natural that I would try my paw at it too. I didn't give Mom too much trouble with any of my training. She was pretty excited when I ran like a seasoned dog in my first tournament in December 2011. I ran a best time of 4.24 seconds and Mom and I were still getting comfortable with passing in that environment! 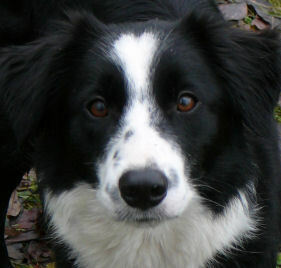 When I'm not at flyball, my favourite things to do are agility, herding and musical freestyle. My best tricks are jumping into Mom's arms, and weaving between her legs. My favourite toy is the ball, but I love the tuggy now too. The best place in the house, if you ask me, is in Mom's lap - and that's a-ok by her too, since she thinks I am the sweetest girl ever!